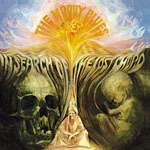 Share the post "Album review: THE MOODY BLUES – In Search Of The Lost Chord (50th Anniversary edition)"
I’ll be honest, I was never a big Moodies fan. And this 3 CD/2DVD wallet busting re-visitation is clearly aimed at their most ardent followers i.e. those only too ready to meet the hefty £41.99 price tag. Having already, presumably, invested in the 2006 SACD remastered deluxe edition, and/or the 2008 single CD remaster (with bonus tracks). It’s a big ask. Plus, to get the most out of the package you’re going to need a 5.1 sound system. I don’t, and we’ve not had the full box set made available to us, so it’s not possible to comment on that aspect, although online commentary seems decidedly underwhelmed. So what you get for your buck is another remaster of the original mix, a new stereo remix, plus assorted bonus and unreleased tracks, including a never-before-heard mono version of ‘Legend Of A Mind’, and BBC Radio One John Peel ‘Top Gear’ and ‘Afternoon Pop Show’ sessions, as well as mono mixes of related Deram single A and B sides. DVD content includes 96kHz/24-bit 5.1 Surround, new and remastered original stereo mixes, various TV appearances, and the whole package is rounded off with a 76-page hard back book. If that doesn’t tempt you, there’s 2 vinyl versions – the ‘standard’ 180-gram, and the Limited Edition psychedelic coloured – both with ‘original’ packaging. And finally, for those with shallow pockets (and perhaps only a passing interest) there’s probably all you actually need – a single CD release featuring the new stereo mix plus assorted bonus tracks. As an album that already has undisputed ‘classic’ status, far be it from me the revisit its merits. And if you want to dissect the subtle nuances introduced by the remixes then you’ll find plenty of sad, sorry, I mean ‘like-minded’ people online only too happy to discuss whether a vocal has been moved from its original position in the soundstage, or whatever. Listening to 128mbps promo mp3s is never going to highlight the most subtle of nuances, but suffice to say, both the new remaster and remix sound, to borrow John Barrowman’s I’m A Celebrity catchphrase, ‘Fabulous!!!’. The differences are subtle, rather than earth shattering, and whether one is superior to the other is a matter of personal taste. But there is a more fundamental question about whether we should be re-writing history with remixes of this sort. And whether remasters – beyond where the existing release is from an inferior source – are really justified. This entry was posted in ALBUM REVIEWS, ALBUM REVIEWS (Mobile), All Posts, Reissues and tagged 50th anniversary, album, classic rock, In Search Of The Lost Chord, John Lodge, JUSTIN HAYWARD, Micjael Pinder, progressive, Ray Thomas, reissue, review, The Moody Blues. Bookmark the permalink.